Re: JUPITER AND IO - AND DMITRIEV! Hi StefanR, and Nick, and Gary, and Michael! Actually, what I like best about Dmitriev is that he does not give “doomsday” conclusions. He of course states the facts about catastrophes that have happened and those that may yet come to pass, but what he underlines is the awesome opportunities that the ongoing transformations entail for our evolution. Dmitriev explains, when delving on Vacuum Domains, that our world is being subject to what we might call a sort of energetic insemination (please excuse a laywoman’s description of a phenomenon she can hardly grasp), a "donation of energy/matter" by virtue of which we are witnessing the transformation of the nature of Nature, the emergence of a “world within worlds” or of "interworld processes" that bring us the chance to literally leap unto a higher state of consciousness. “All of this places humanity, and each one of us, squarely in front of a very difficult and topical problem; the creation of a revolutionary advancement in knowledge which will require a transformation of our thinking and being equal to this never-before-seen phenomena now presencing itself in our world. Ready to surf the Renewing Flow? "There are reasons favoring, or pointing to, the fact that a growth in the ethical, or spiritual quality, of humanity would decrease the number and intensity of complex catastrophes." I shall repeat that I am not a scientist, but someone eagerly trying to understand more, and grow. In that pursuit I have become aware of the immense body of thought and research that is, to this date, not being considered as thoroughly as it should. That applies very specifically to the pioneering work by N.A. Kozyrev. I bring up his name because I surmise that the statement you object by Dmitriev is based (at least, in part) on Kozyrev’s postulates. “In recent years some publications have appeared which confirm the results of theoretical, laboratory and astronomical investigations performed by N.A.Kozyrev. effecting the cosmos, it is the cosmos that effects humans. These structures, or objects, then interact with the heliosensitive zones producing deep and powerful effects upon the environment such as the alteration of seismic activities, and chemical compositions. Because these non-homogeneous vacuum domain objects display not-of-this-physical-world characteristics such as "liquid light" and "non-Newtonian movement" it is difficult not to describe their manifestations as being "interworld processes". It is important to note that those heliosensitive zones that exhibit middle and large scale processes are also those that are closely associated with these "interworld processes" produced by physical vacuum homogeneity disturbances. Such disturbances cause, and create, energy and matter transfer processes between the ether media and our three-dimensional world. The multitude of such phenomena, which is rich in it's quality and variety, is already growing quickly. Hundreds of thousands of these natural self-luminous formations are exerting a increasing influence upon Earth's geophysic fields and biosphere. We suggest that the presence of these formations is the mainstream precedent to the transformation of Earth; an Earth which becomes more and more subject to the transitional physical processes which exist within the borderland between the physical vacuum and our material world. There is no other path to the future than a profound internal experiential perception and knowledge of the events now underway in the natural environment that surrounds us. It is only through this understanding that humanity will achieve balance with the renewing flow of the PlanetoPhysical States and Processes. This essay by Dmitriev is obviously a very “general” type of text that tries to convey an extremely specialized subject to the common reader, while keeping within the constraints that scientists demand. Surfing the Internet, I found out that other prominent figures of the Russian Academy of Sciences have been researching and writing for many years on these and even more ‘controversial’ subjects, and those still living continue to do so. I surmise that Dmitriev’s work takes into account the findings and postulates by N.A. Kozyrev and G. Shipov, among others. It is of no small import that those scientists were struggling to do their work and make it be known even under the reactionary and repressive policies they endured in the past. We read that Kozyrev came unto his most notable insights while being in prison. (regarding those available in Russian all I can do is use digital translation devices, not very helpful, to be sure). Jupiters develops NEW RED SPOT! In line with all those recent changes in our solar system - most possibly due to enhanced EM-activity by our Sun - a former white spot on Jupiter, northeast of the Little Red Spot (in the pic below that one on the left), has turned RED as well. Re: Jupiters develops NEW RED SPOT! Okay, let's open up the thread a little... Beyond just the rings. Back to the RED SPOT on Jupiter for a moment. As I remember, the element Helium (He) has a characteristic color of near salmon pink towards the reddish when bombarded with the right amount of electricity and appropriate temperature and pressure - e.g. in a low voltage fluorescent lamp. Similar to our Sun, the Helium plasma emits light when electrons from the ionized Helium give off energy in the form of photons as they return to a lower energy level. If not too hot (5,000°C or so) so it may turn otherwise into "Black-body"-emission, glowing all across the spectrum (white), as almost any substance will do at high temperatures. 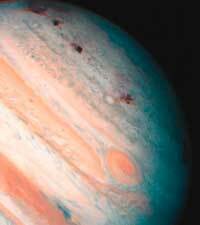 Jupiter is perpetually covered with clouds composed of Ammonium with a core - possibly made of Hydrogen. The atmosphere contains 86 percent Hydrogen, 14 percent Helium according to NASA data. Amounts of Methane, Ammonia, Phosphine, Water, Acetylene, Ethane, Germanium, and Carbon Monoxide have been estimated as well. The temperature at the top of Jupiter's clouds is about -145° C.
The oval object, known as the "Great Red Spot" since appr. the year 1600, rotates counterclockwise, with a period of about 6 days. The planet Jupiter itself rotates faster than any other planets (9 hours 56 minutes to spin around once on its axis). The spot remains at the same distance from the equator but drifts slowly east and west. These Jovian phenomenons(zones, belts, and the Great Red Spot) are much more stable than similar circulation systems on Earth. The exact makeup of those Red Spots remains uncertain (they elevate appr. about 8 kms higher than their surrounding clouds), but the substances involved are believed to be Phosphorus, Sulfur or possibly Hydrocarbons. These colorful compounds, known as chromophores, mix with the warmer, lower deck of clouds and may be due to small amounts of Sulfur and Phosphorus in the Ammonia crystals. The zones are formed when rising convection cells form crystallizing Ammonia that masks out Jupiter's lower clouds from view. So, could those Red Spots be as well an effect closely tied to electrical phenomenons, after all? Does lightning occur only on Earth? Spacecraft in our Solar System have detected radio signals consistent with lightning on other planets, including Venus, Jupiter, Saturn, Uranus, and Neptune. 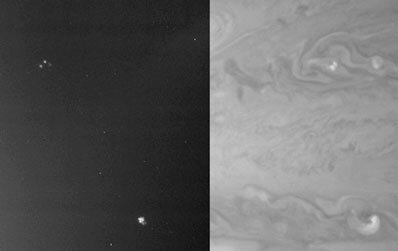 In the above photograph, optical flashes from Jupiter were photographed recently by the Galileo orbiter. Each of the circled dots indicates lightning. The numbers label lines of latitude. The size of the largest spot is about 500 kilometers across and might be high clouds illuminated by several bright lightning strokes. This Galileo image highlights a convective storm and associated lightning in Jupiter's atmosphere. The left image highlighted area shows the daytime view; the right images show the same area during the night. The Jovian latitude and longitude are shown in the left panel. A convective thunderstorm northwest of Jupiter's Great Red Spot is shown in this false-color image. The white area in the center is a tall, thick cloud higher than most of the surrounding clouds. Most of the wisps and features are thick and thin ammonia clouds, forming at a pressure just less than Earth's sea level pressure. The red base of this thunderstorm is a water cloud. The blue and green areas depict higher clouds, while the red areas show deep clouds as well as those higher in the atmosphere. A new batch of Jupiter images from NASA's Cassini spacecraft demonstrates some of the ways scientists are using Cassini's camera to learn more than what first meets the eye, such as determining particle sizes in clouds and identifying which storms produce lightning. One new picture is the best yet taken of the small moon Himalia, and is the first ever to show one of Jupiter's outer moons as more than a star-like dot. One pair of frames shows the same portion of the planet both in daylight then after it had rotated to the night side, showing that only certain small areas were producing lightning. These two frames of composited images taken by Cassini show the same cloud patterns on Jupiter both in natural color (left) and in a false-color combination (right) selected to show differences in clouds' height. The white spots in the right frame are storms high in the atmosphere. The left frame shows the colors Jupiter would have if seen by the naked eye. The right frame is composed of three images. 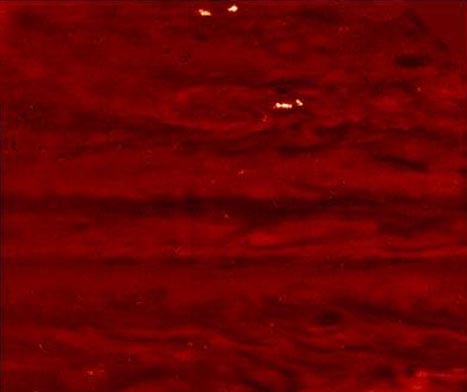 Two were taken through filters centered on regions of the spectrum where the gaseous methane in Jupiter's atmosphere absorbs light, and the third was taken in a red continuum region of the spectrum, where Jupiter has no absorptions. The combination yields an image whose colors denote the height of the clouds. 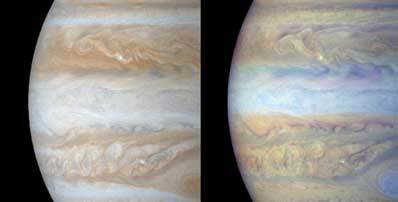 Red regions are deep water clouds, bright blue regions are high haze (like the blue covering the Great Red Spot). Small, bright white spots are energetic lightning storms that have risen to a height where there is no opportunity for absorption of light, so the clouds reflect all light equally. The darkest blue regions, such as the long linear regions bordering the northern part of the equatorial zone, are the very deep 'hot spots' from which Jovian thermal emission is free to escape to space. Images taken of Jupiter's day and night sides by Cassini on Jan. 1, 2001 show that storms visible on the day side are the sources of visible lightning when viewed on the night side. The two day-side occurrences of high clouds, in the upper and lower parts of the image, are coincident with lightning storms seen on the dark side. The storms occur at 34.5 degrees and 23.5 degrees North latitude, within one degree of the latitudes at which similar lightning features were detected by the Galileo spacecraft. The storms' longitudinal separation changes from one image to the next because the winds carrying them blow at different speeds at the two latitudes. The images have been enhanced in contrast. One of the experiments on board the Galileo Probe was the Lightning and Radio Emission Detector. Whilst the Galileo probe descended through Jupiter's atmosphere it looked and listened for the tell tale signs of lighting bolts. The results showed that lighting occurs on Jupiter less than here on Earth but when it does occur it is usually more intense. We hear thunder on Earth since the electrical energy that passes down the 'bolt of lightning' causes the air around it to expand faster than the speed of sound. This effectively produces mini sonic booms which we hear as thunder. On Jupiter the lightning would also produce such sounds although due to the denser atmosphere the speed of sound is a little lower there. We could therefore expect to hear the 'thunder' affect a fraction of a second sooner than its counterpart here on Earth. On Jupiter the cyclones are amorphous, turbulent regions that are spread out in the east-west direction. In the Voyager movies they spawn rapidly-expanding bright clouds that look like huge thunderstorms. The Galileo lightning data confirm that convection is occurring there. "We even caught one of these bright clouds on the day side and saw it flashing away on the night side less than two hours later," says Ingersoll. In contrast, the Jovian anticyclones tend to be long-lived, stable, and oval-shaped. The Great Red Spot is the best example (it is three times the size of Earth and has been around for at least 100 years), but it has many smaller cousins. No lightning was seen coming from the anticyclones. "That probably means that the anticyclones are not drawing energy from below by convection," says Ingersoll. "They are not acting like Jovian hurricanes"
Instead, the anticyclones maintain themselves by merging with the smaller structures that get spun out of the cyclones. "That's what we see in the Voyager movies, and the Galileo lightning data bear it out. "Whether the precipitation is rain or snow is uncertain, says Ingersoll. "Models of terrestrial lightning suggest that to build up electrical charge, both liquid water and ice have to be present. Rain requires a relatively wet Jupiter, and that's a controversial subject. "Water is hard to detect from the outside because it is hidden below the ammonia clouds. And the Galileo probe hit a dry spot where we didn't expect much water." Fortunately the Galileo imaging system caught glimpses of a cloud so deep it has to be water, according to findings to be reported at the conference by Dr. Don Banfield of Cornell University and an imaging team affiliate. Banfield showed images of the water cloud near the convective centers in the cyclonic regions. MADISON, Wisconsin-Images of Jupiter's night side taken by the Galileo spacecraft reveal that the planet's lightning is controlled by the large-scale atmospheric circulation and is associated with low-pressure regions. 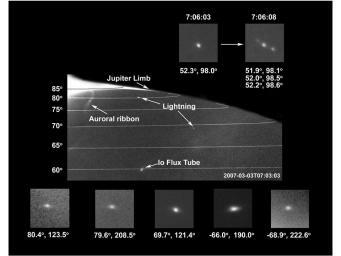 Images taken by the New Horizons Long-Range Reconnaissance Imager (LORRI) of Jupiter's night side showed lightning strikes. Each "strike" is probably the cumulative brightness of multiple strikes. 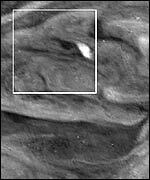 This is the first lightning seen at high latitudes on Jupiter; it demonstrates that convection is not confined to lower latitudes, implying an internal driving heat source. Their power is consistent with previous lightning measurements at Jupiter's lower latitudes, equivalent to extremely bright terrestrial "super bolts." A brief but bright flash of light as big as Earth spotted near Jupiter's north pole by the Hubble Space Telescope has scientists stumped. When the flare erupted, researchers were using Hubble to study an auroral oval, one of two permanent rings of light that glow in the atmosphere above Jupiter's poles. The flare, centered inside the northern oval, was five times brighter than the aurora and lasted about five minutes, peaking intensely during a one-minute stretch. "The flare is far brighter than anything we've seen before at Jupiter," said Randy Gladstone of the Southwest Research Institute. "The amount of energy released is comparable to an atomic bomb blast." Lead author J. Hunter Waite, of the University of Michigan, told SPACE.com that additional Hubble observations showed a handful of smaller flares, pointing to the possibility that such events are fairly routine. Waite said only Hubble has the sensitivity to spot the events, explaining why they had not been seen before. Jupiter's auroral oval is similar to the colorful aurorae on Earth. These terrestrial light shows grace the far northern and southern night skies when charged particles called electrons, riding away from the Sun on the solar wind, slam into our planet's protective magnetic field. The interaction triggers a release of light energy. With Io providing a source of electrons, particles riding on the solar wind are thought to be only a minor contributor to Jupiter's auroral oval, especially since the solar wind is significantly weakened by the time it reaches Jupiter (which is more than five times as far from the Sun as Earth). But Waite and his colleagues speculated that pulses in the solar wind, which increase its pressure, might be responsible for the sudden Jovian flares. Bursts of solar wind are known to create similar but less intense fluctuations in Earth's aurora. Solar wind conditions at the time of the Jovian flare were not unusual, Waite and his colleagues write in Nature. What appear to be typical pulses of solar wind activity were recorded by other space-based equipment, though not with certainty. The authors say that this apparently normal solar activity at the time of the largest Jovian flare "suggests that such flares, if indeed triggered by changes in solar-wind pressure, may not be uncommon." Astronomers have witnessed the first auroral flare ever seen on Jupiter. The dramatic flare occurred while they were watching Jupiter's north pole through the Hubble Space Telescope. They saw an expanding region of light that covered an area the size of Earth in a matter of minutes, and disappeared just as fast. [Some] [s]cientists believe that the eerie glow near Jupiter's poles is ... caused by interactions between electrons and the planet's atmosphere, but [the believe] the electrons come from Jupiter and not the solar wind. Some believe that the electrons originally come from volcanoes on Jupiter's moon Io. Charged particles given off by them spiral towards Jupiter and are energised by Jupiter's magnetosphere, releasing light at the auroral oval. Somehow a burst of these electrons were channelled onto one particular region near Jupiter's north pole causing the dramatic rise in emissions. However, the researchers, describing their observations in the journal Nature, do not yet have an explanation for the precise mechanism that caused the dramatic flare. 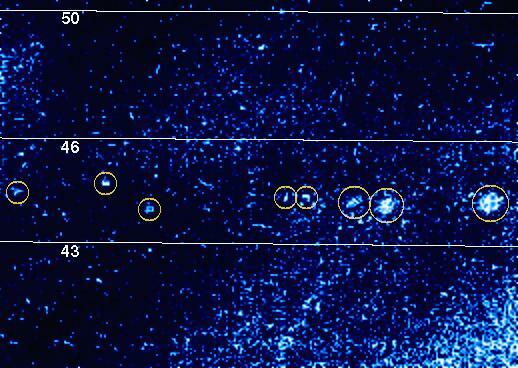 X-ray spectra measured by Chandra showed that the auroral activity was produced by ions of oxygen and other elements that were stripped of most of their electrons. This implies that these particles were accelerated to high energies in a multimillion-volt environment above the planet's poles. The presence of these energetic ions indicates that the cause of many of Jupiter's auroras is different from auroras produced on Earth or Saturn. "These results will help scientists to understand the mechanism for the power output from Jupiter's auroras, which are a thousand times more powerful than those on Earth." Electric voltages of about 10 million volts, and currents of 10 million amps - a hundred times greater than the most powerful lightning bolts - are required to explain the X-ray observations. These voltages would also explain the radio emission from energetic electrons observed near Jupiter by the Ulysses spacecraft. The bow shock of a planet serves the function of slowing the solar wind flow past the planet and deflecting it around the obstacle. In the process, the energy in the bulk motion of the solar wind is converted into thermal energy at the shock. That is, the solar wind observed downstream (planetward) of the shock is found to be much hotter than the unperturbed supersonic solar wind. In many respects, these same processes occur in the atmosphere around a supersonic aircraft. To be sure, there are several complications associated with the fact that the solar wind is a plasma and not simply a neutral gas, but the analogy is still good in many qualitative ways. The bow shock is an interesting region within which to study plasma waves. Recall that any perturbation to a plasma may result in the generation of plasma waves. In some cases it may be that the plasma waves act as one mechanism for heating the plasma, turning the energy of bulk flow of the supersonic plasma into the more chaotic downstream flow of a heated plasma. In other cases, the waves generated at the shock may simply be a result of the heating process and be of more interest for their diagnostic utility than for playing a major role in the thermodynamics of the shock. Voyager 1 made a remarkable set of observations of the Jovian bow shock as it crossed the boundary on 28 February 1979 some 72 Jovian radii from the planet. The schematic view of the Jovian magnetosphere above shows the relative position of the shock and the magnetosphere and the trajectory of Voyager 1. The wave measurements are most often studied in the form of frequency-time spectrograms such as the one depicted here. The observations which are presented in the spectrogram represent the wave data in the frequency domain. However, the original observations are a simple time series of measurements of the voltage across the antenna on Voyager. The instrument collects these waveforms in a frequency bandwidth extending from about 40 Hz (cycles per second) to 12 kHz (12,000 cycles per second). This frequency range is well within the audio frequency range, hence, if we could convert the electrical energy into sound waves, we could listen to these waves. In fact, the computer can take the electrical signals detected by Voyager and use them to generate sound waves by sending the electrical signals through the coil of the speaker in your computer. In some ways, this is similar to the way a CD player converts digital samples of the music on your CD into sound. Since the frequency range is already well within hearing range, no shift in frequency is required. If your Web client has audio capabilities, you may be able to listen to the signals detected by Voyager as it passed through the bow shock. The waveform instrument has a 92.6% duty cycle and we have further reduced the total duration of the audio by retaining only one-third of the available time slices, compressing 2.4 minutes of data into 44 seconds (without frequency shift). It is useful to refer to the spectrogram above as you listen to the audio. The study of plasma waves in space plasmas involves the measurement of the characteristic frequencies of the plasma in order to understand basic properties of the plasma such as its density and the effect of the magnetic field which may be threading the plasma. Since the charged particles in a plasma respond to static and oscillatory electromagnetic fields, strong interactions can occur between these plasma waves and the underlying charged particles in the plasma. These strong interactions are often called instabilities. Electron plasma oscillations at the plasma frequency (sometimes called Langmuir waves) are one example of an instability in a plasma. In many cases, plasma waves and instabilities are important in understanding the state of the plasma, the evolution of energy and the flux of plasma in a magnetized plasma, and a number of other interesting phenomena. One example is the case of strong whistler mode waves in the magnetosphere of a planet. These waves have phase velocities which nearly match the motion of electrons around the magnetic field and can, therefore, have a profound effect on the motion of the electrons. In this case, the result can be a scattering process which would dump electrons otherwise trapped in the Earth's Van Allen radiation belts into the atmosphere causing the aurora or northern lights. Many other examples can be discussed. Plasma waves are generally waves that are at or below the various characteristics of a plasma. Generally speaking, such waves do not propagate very far in a plasma and are strongly influenced by the magnetized plasma when they do propagate. In many cases the plasma or plasma waves can generate waves at frequencies that are very high in frequency compared to the highest characteristic frequency of a plasma. In this case the waves are electromagnetic and can propagate away from their source with little interaction with the surrounding medium. These high frequency waves are often referred to as radio waves. Unlike plasma waves, radio waves can propagate more or less freely through a plasma from the source to an observer and the radio waves become part of the remotely sensed electromagnetic spectrum of the body just like visual, infrared, or ultraviolet emissions. Jupiter was the first planet discovered to have a radio spectrum and it was from this spectrum that many conclusions were drawn about the existence of a strong magnetic field, hence substantial magnetosphere, at Jupiter long before Pioneer 10 flew past the planet to make in situ observations. In addition to a simple detection of the magnetic field, radio waves allowed an accurate estimate of the intensity of the planetary magnetic field, the orientation of the field with respect to the rotational axis of the planet, and even a measurement of the internal rotation rate of Jupiter.